From the Dr. Seuss collection by Vandor. Dr. Seuss The Grinch 20 Ounce Heat-Reactive Ceramic Mug. This Item is in stock and ready to ship. You should not postpone your purchase and miss out on adding Dr. Seuss The Grinch 20 Ounce Heat-Reactive Ceramic Mug to your Dr. Seuss collection! From the Dr. Seuss collection by Vandor. Dr. Seuss The Grinch 20 Ounce Heat-Reactive Ceramic Mug. 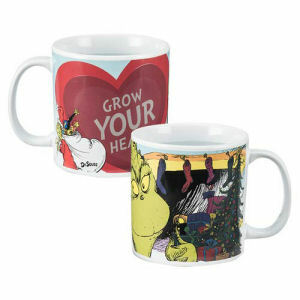 The grinches black heart changes to a big red heart when hot liquid is added to this Dr. Seuss Mug. Hand wash only. Not dishwasher safe. Do not microwave.